The Skinny: From deep inside the Shaw Brothers vault comes the box office hit comedy that swept Hong Kong by storm. 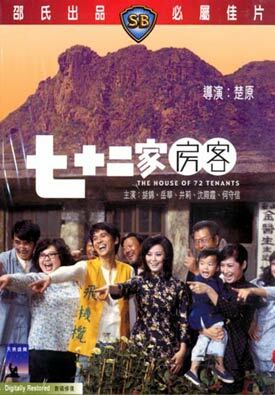 Still, despite the fact that House of the 72 Tenants is widely considered to be a classic of Cantonese-language cinema, the cultural gap may be too wide for most Western viewers to cross. Upon its release in 1973, House of the 72 Tenants was so popular that it broke the box office records set by the films of legendary screen icon, Bruce Lee. Consequently, this big screen adaptation of a stage play is credited with changing the negative perception towards Cantonese language films, and thus becoming a landmark film in Hong Kong cinema history. It has even been said (rightly or not) that without this film, Stephen Chow would not have a career. Now, thanks to the folks at Celestial Pictures, the film is getting the remastered DVD treatment so audiences both old and new can see for themselves. But does the classic stand the test of time? Well, that depends on a lot of things. Modern fans more familiar with Kung Fu Hustle than any Shaws film will immediately recognize Pig Sty Alley's predecessor in House of the 72 Tenants, as we find a cast of several dozen people crowded together in a crappy tenement slum. The place is ruled with an iron fist by its strict landlady, Pak Ku (Hu Chin), who along with her sleazy husband Chow Bing-Ken (Tien Ching), tries to exploit their tenants in whatever way they see fit. In the early goings, the conflict escalates when the likable laundrywoman Shanghai PO (Lydia Shum) challenges Pak Ku's unfair restriction that the tenants' water usage be limited to two tubs per day. However, that's not the crux of the film. Things start to get interesting when Pak Ku's beautiful and well-liked stepdaughter Ah Heung (Ching Li) embarks on a chaste romance with Fat Chai (Yueh Hua), a local cobbler and all-around decent human being who's not afraid to stand up to the landlord and their unfair practices. With the help of the comically corrupt Police Constable 369 (Lau Yat-Fan), Pak Ku and her husband try to sell Ah Heung into prostitution and frame Fat Chai for numerous crimes, all without success. But really, this is just a small sample of what goes down in House of 72 Tenants, a somewhat comical story of folks pulling together in trying times, helping each other out as they try to battle "The Man," who in this case comes in the form of a woman, the irredeemable Pak Ku. Full of satirical comedy and exaggerated humor, House of the 72 Tenants can be described as basically a celebration of the common man (and woman). The movie unfolds in a series of vaudeville-like bits, as an endless parade of characters march in and out of the narrative. In the process, there are several welcome, but all-to-brief cameos by the likes of Lily Ho, Adam Cheng, Ricky Hui, Chen Kuan-Tai, and Danny Lee. The idea behind this episodic treatment of the plot, it seems, is to give the viewer a slice of life, however exaggerated, of what it's like for lower class Hong Kongers as they struggle to make it in an unforgiving work-a-day world. But however bad the situation, the film spins things in a positive light by showing how a tight-knit community can survive by putting their faith in each other in even the worst of times.